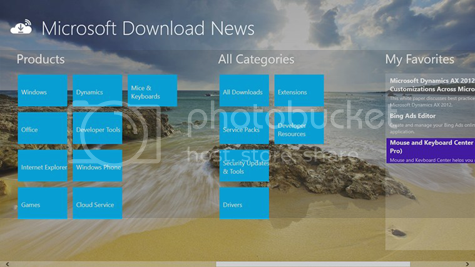 Microsoft Download News is a freeware Windows 8 Application available in Windows Store. With Microsoft Download News one can quickly view the latest resources on Microsoft Download Center. This application requires Internet connection in order to get the download news from Microsoft website. We guarantees that none of your data will be collected or used nor any extraordinary information will be saved for private purposes. All most wanted Microsoft Products updates can be viewed in this app and can be downloaded. The good thing is that Microsoft Download News lets you add the selected download to a favorite list in order to access it at a later time. It works on all Windows 8 platforms, including x86, x64 and ARM devices. Click here to view the Microsoft Download News product page in your browser.